One-IT held a big event dedicated to its B2B customers. At its 4th edition, Innovation hosted over 130 elite guests. Innovation IT is already a tradition and has created a bridge between businesspeople with vision and the latest IT solutions dedicated to the business environment, specially designed to streamline and advance regional businesses, and beyond. This event was successfully organized with the support of the Innovation IT partners: Bitdefender, Xerox, Fortinet, Point Mobile, TP-Link, Lenovo, BlackBerry, SonicWall, Newline, HP, Cooler Master, Ubiquiti, CyberPower, Epson, Spacer, Honeywell, and Elo. Teams of specialists have presented in a novel and interactive way the latest B2B solutions. The 4th Edition of Innovation IT aims to offer B2B One-IT customers a good space for collaboration, understanding, and knowledge of the latest IT solutions. They are designed to bring real growth to companies that want to grow, streamline their business, and take a breakthrough in business success with the help of new technology in the industry. At the same time, One-IT successfully celebrated 15 years of business with clients and collaborators, which was possible thanks to the trust and the desire to provide clients with the right solutions for their needs. The event held a series of innovative and highly relevant solutions for today’s business trends and needs. This year’s speakers were from renowned companies in the field and debated topics of maximum relevance, coming up with new solutions specifically designed for the B2B sector. Among the solutions presented were: device security solutions and on-premise solutions, business solutions on smartphones, Augmented Reality Enterprise Solutions, innovative networking solutions, productivity enhancement solutions, advanced interactive collaboration solutions for retail, education, and business. All of these respond to the needs to maximize efficiency and productivity, security and interactive collaboration in business. In addition to the highly exciting workshops, a demo session was held to present the industry’s revolutionary IT equipment and solutions that can be personalized and adapted in real time to each individual customer, according to his needs. During the demo session, the participants had the opportunity to analyze and test the state-of-the-art equipment at the partners’ stands. 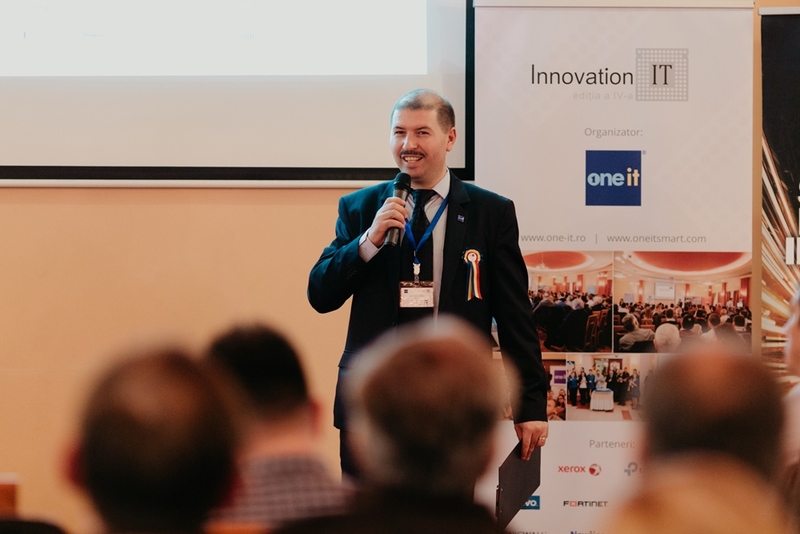 One-IT had the great pleasure to introduce at Innovation IT its own innovative enterprise solutions based on Augmented Reality technology, with which it has launched itself on the international market. Claudiu Cocioban, Business Development Manager at One-IT, present these new smart solutions. They aim to increase efficiency, reduce human failures and develop in a smart and easy way every undertaken activity. At Innovation IT, clients and collaborators have had the chance to socialize and exchange ideas and good practices, future plans, moments that have strengthened the professional relationships between business people in the area and beyond. One-IT held a raffle dedicated to One-IT customers and collaborators who received many surprise prizes, such as laptops, phones, multifunction printer, routers, car cameras, coolers, keyboards, headphones, kits etc. Innovation IT is an important and unique event because it brings to the attention of the regional business community innovative solutions and visions that use the latest technology to develop a company’s business. At the same time, the direct interaction between representatives of companies in a friendly and professional environment adds value to the professional relationships between companies and allows the promotion of visions focused on the future and professional development at the highest level. We thank all our partners, collaborators and customers for trusting in us and for being with us all these years. We will continue to offer pertinent and useful IT solutions that add value to each company and lead them on the path to success. 2 Comments on "Innovation IT 2018: a unique business event organized for the One-IT B2B clients"
An excellent event! Congratulations One IT for your 15 years of activity! Thank you for your kind words. We are thrilled that you enjoyed this event, and we will do our best to continue offering valuable IT solutions to everyone.